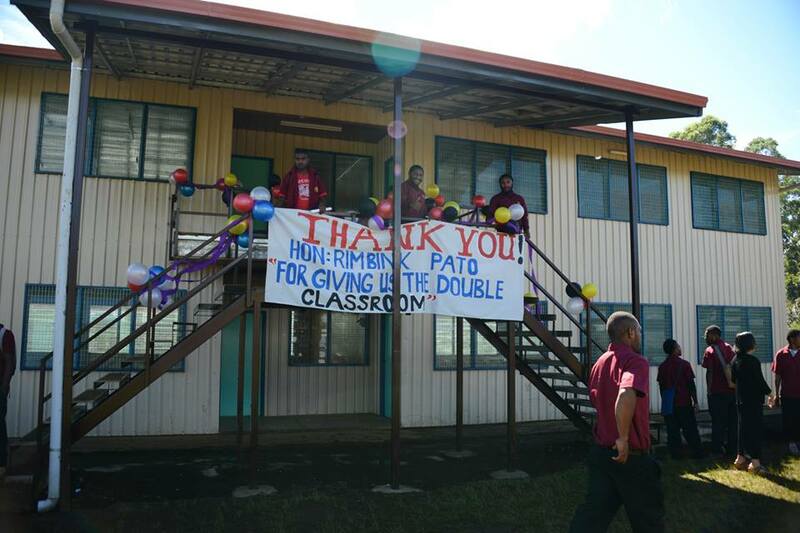 Teachers accommodation complex funded by the Enga Provincial Government under Grand Chief Sir Peter Ipatas. 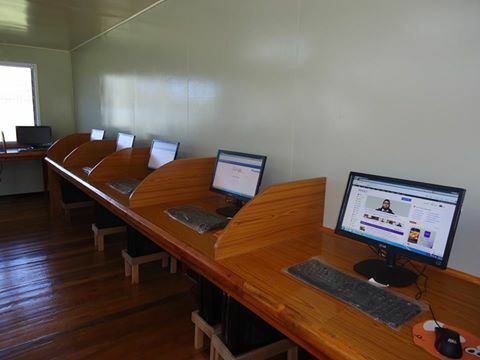 ADOC Computer Laboratory Ready to Take its 1st Intakes for Basic Computing Courses and starting enrolment on Monday 12.01.2015. Course includes: How to use computer, Log in & out, Microsoft Word, Excel email, web search etc. Check out for enrolment forms at the district office or Pausa ADOC lab. First 43 on first come first serve.Pictures below shows online computers, chair deployment, security door & windows. The long awaited ADDOC Computer Lab / School & Community E-Library is close to being completed. 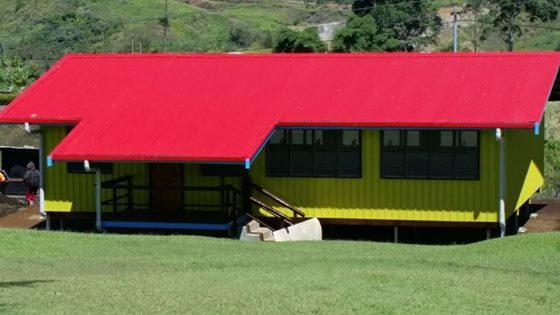 This project is the vision of the local MP and a joint venture with the Government of Taiwan and St. Paul's Lutheran Secondary School. 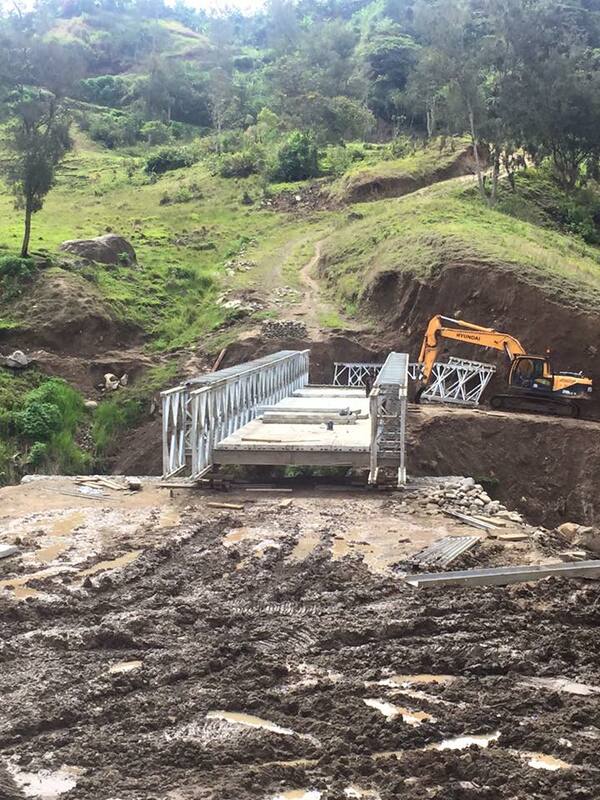 Wapenamanda MP recently escorted a delegation of Japanese Government officials to visit the proposed Japanese Aid funded bridge pictured below. 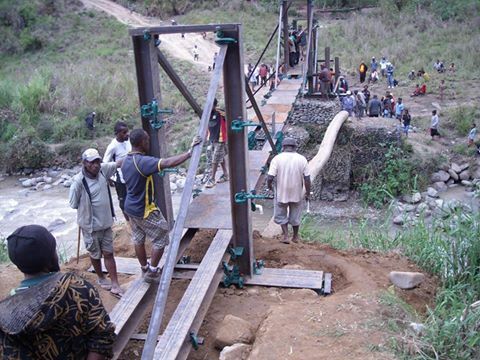 The Akip Bridge when constructed will connect Tupikoros a village in the Lower Lai constituency into Wapenamanda District of Enga Province. 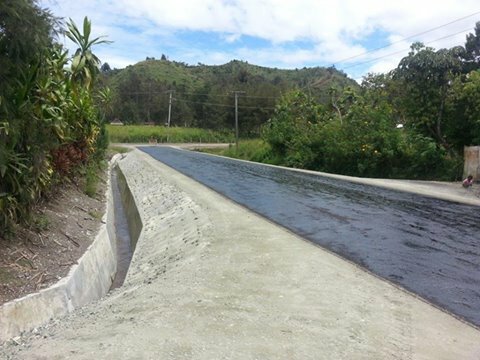 In addition, it will provided a direct route to Madang opening up the "Economic Corridor" to Enga Province through Wapenamanda Town. 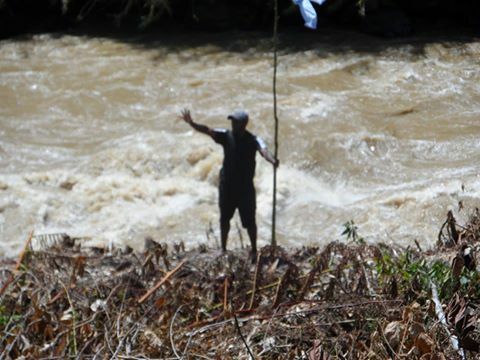 Pictured below are community members clearing ground at the old location of the previous Akip Bridge. The new proposed location is also pictured below. See the labels on the individual photos. Infrastructure development is now underway in the remote Lower Lai community which has been cut-off from development for the past several years. Pictures of the work being done on the bridge are posted below. The Hon. 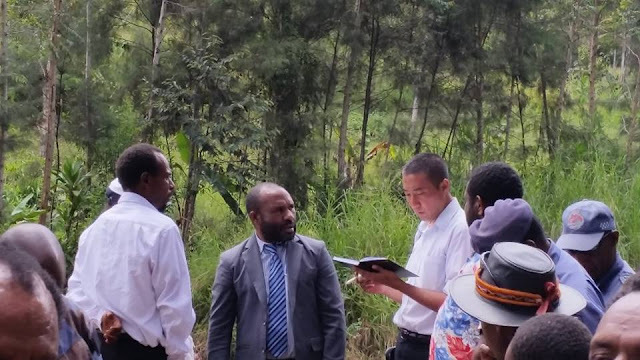 Rimbink Pato, MP (Minister for Foreign Affairs & Immigration), the Enga Provincial Government & Wapenamanda District Administration warmly welcomed Ambassador Matshumoto from Japan along with Daisuke Horikoshi & Naomasa Kugimoto from Japan International Cooperation Agency (JICA). The delegation arrived to a warm reception at the Wapenamanda airport where community leaders and local residents extended a warm welcome to the Member and the delegation from Japan. 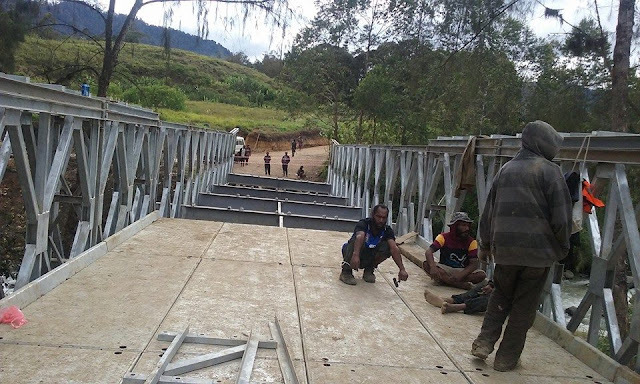 The group then boarded a chopper and visited some local schools and the proposed bridge sites where the Government of Japan may be funding, designing and building 3-4 bridges in the Wapenamanda District in Enga Province. 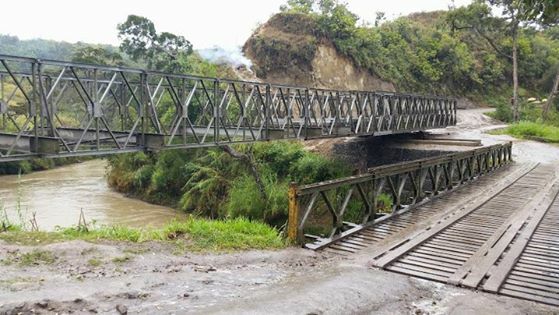 The bridges are the Timin bridge in Lower Lai and the Waikim, Tale & Tobak bridges all located in Tsak Valley of the Wapenamanda District, Enga Province. 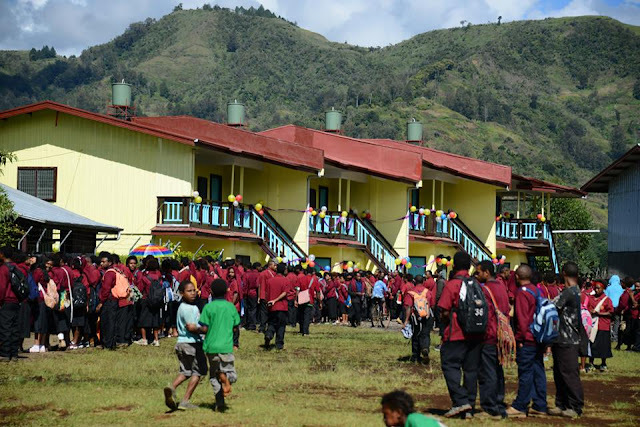 The delegations stopped at Takaepus Primary School in Lower Lai community and addressed a crowd of students and local community members who all expressed their warmest welcome to the Japanese and thanked the Member for delivering major infrastructure development to their area which they haven’t seen in over 40 years. Next stop on the tour was the Angurumanda Primary School located in beautiful Tsak Valley where a large crowd of community members and students warmly welcomed the Member and Japanese Delegation to the area. The Member went on to present a cheque in the amount of K100,000 to the Angurumanda Primary School Administration as a demonstration of his Office’s commitment to the education and preparation of future local leaders. 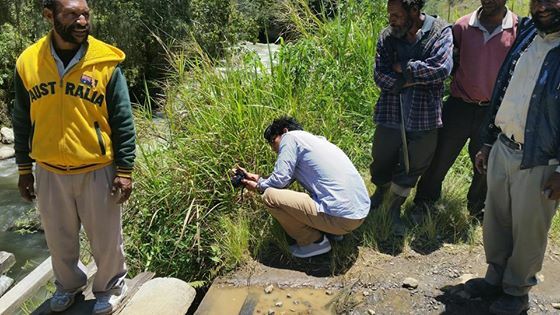 After visiting the sites of the bridges in Tsak, which are in much need of repair or replacement, the delegation then left for to visit a local wildlife lodge where they will be staying to experience Enga culture and they will also be visiting other places throughout the Enga Province over the next few days. 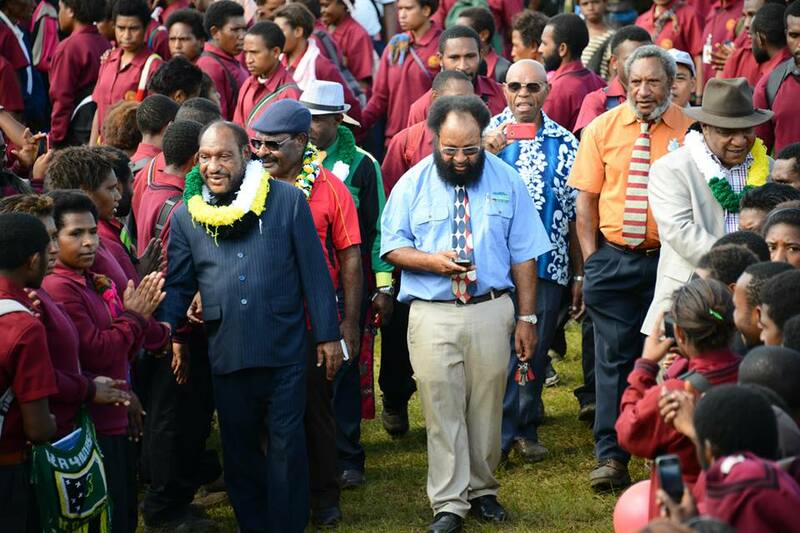 A truly historic event in Wapenamanda District and a sign of things to come as the Government and people work together to make Wapenamanda District, Enga Province and PNG a better place to live and work for today and generations to come. 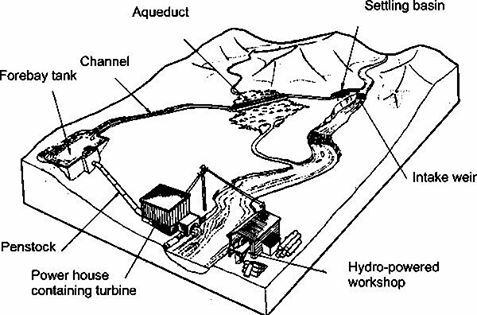 The proposed mini-hydro power scheme will be similar to this model but there will NOT be a hydro powered workshop on the other side of the river. Progressive works on steel frame footbridge in the Aiyale Valley built over a three day period by the Japanese engineers and funded by the DSIP funds at a cost of approximately K200,000.00. 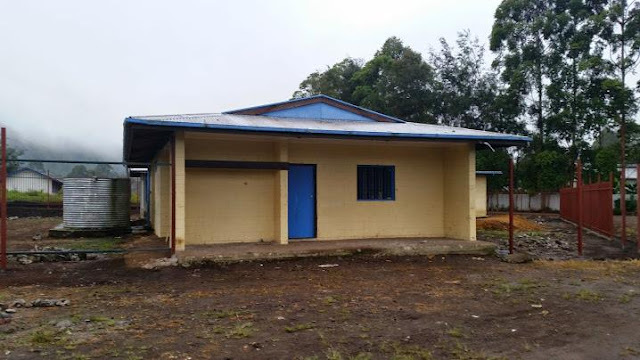 Few more will be built throughout the Wapenamanda for the accessibility of rural communities to markets, hospitals and other government services. 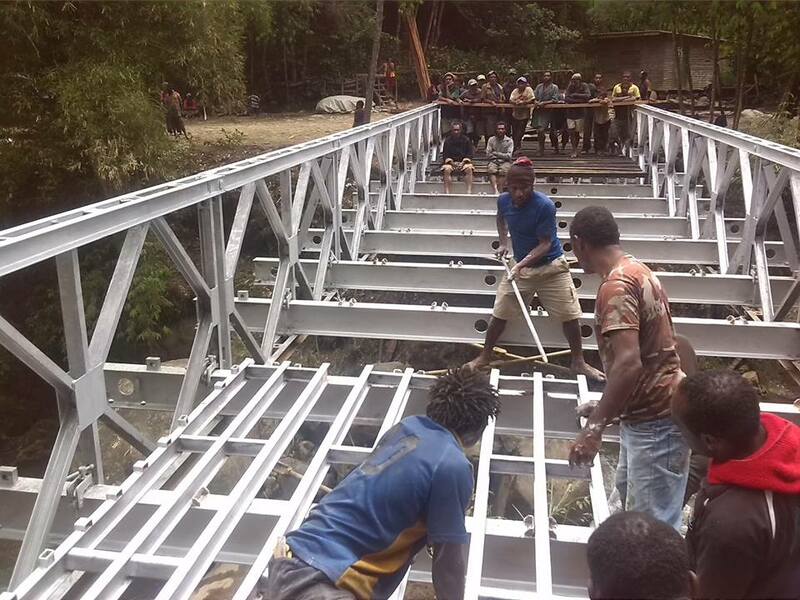 This footbridge is designed and built by Japanese engineers and is being constructed for the first time in Papua New Guinea. 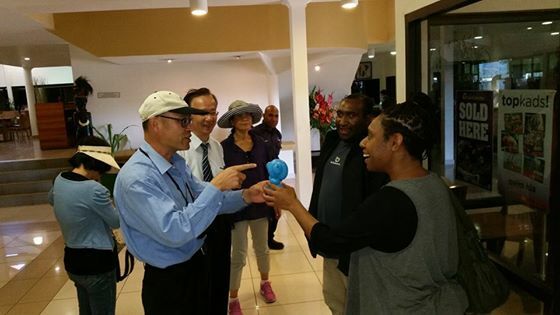 On 8 August, 2014 the Wapenamanda District welcomed the Taiwanese Trade Mission Representative, Daniel Hu and his wife to the District. Mr. Hu accompanied Dr. & Mrs. Albert Hsu who will be volunteering as a resident doctor at Mambisanda Hospital specializing in Oriental medicine. 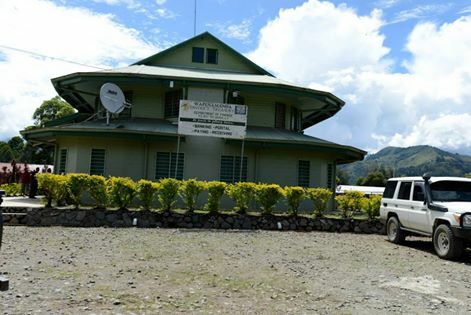 Also visiting the District with the delegation was Dr. Julius Siko, MD (Bouganville, PNG) will also relocating to Wapenamanda with his wife to begin volunteering as a General Medical Practitioner at Mambisanda Hospital. The Taiwanese Trade representative (Mr. Daniel Hu) was able to visit the construction site of the ADDOC Computer Lab and E-Library at St. Paul’s Secondary School (Pausa) of which the Government of Taiwan donated most of the equipment. 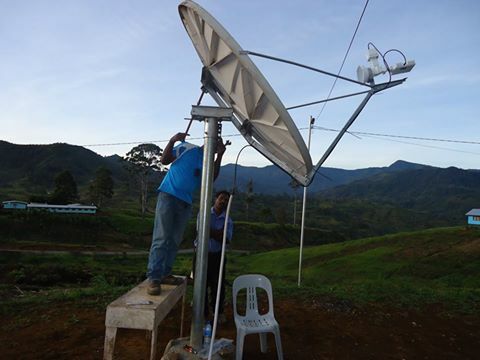 The expected date of completion and commissioning is around October of 2014. The delegation was also able to observer Highlander culture in an up-close and personal way when they attended the Enga Cultural Show in Wabag. It was everyone on the delegation’s first time to visit Enga and also it was the first time Wapenamanda District had the privilege of receiving anyone from the country of Taiwan. The delegation rounded up its trip with an early morning visit to the Kumul Lodge to observe some of the birds native to Enga (eg. Bird of Paradise & Miok). 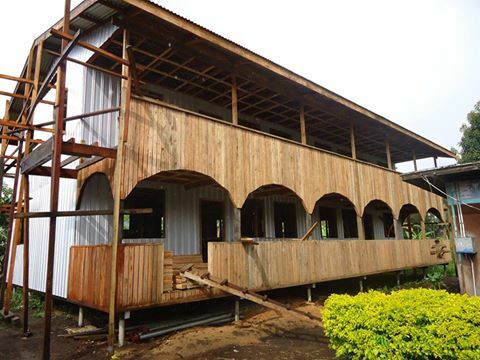 Wapenamanda Town Police Station Renovation (July 2014) - Currently underway in the District. Progress of the installation of the Lokome Bridge. 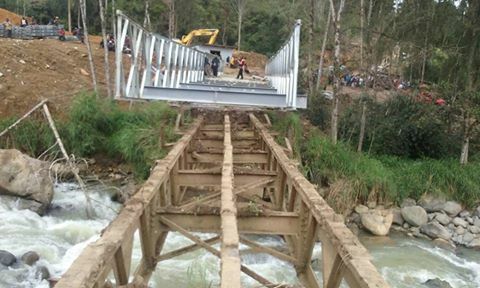 The bridge has been launched across the Minamb River and will be completed in ten days. 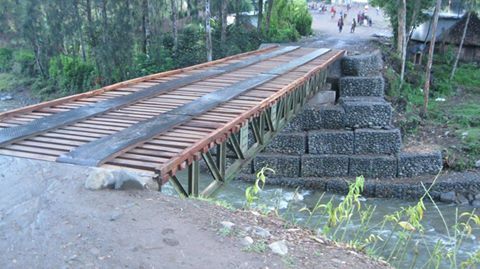 The bridge will serve a population of near 10,000 people and is jointly funded by the DSIP funds and external sources, under the leadership of Foreign Affairs and Immigration Minister and local Wapenamanda MP Rimbink Pato. MINISTER for Works and Implementation and MP for Imbonggu Francis Awesa was given a rousing welcome when he arrived in Wapenamanda for the ground breaking ceremony of Wapenamanda Town Ring roads which cost K8million. 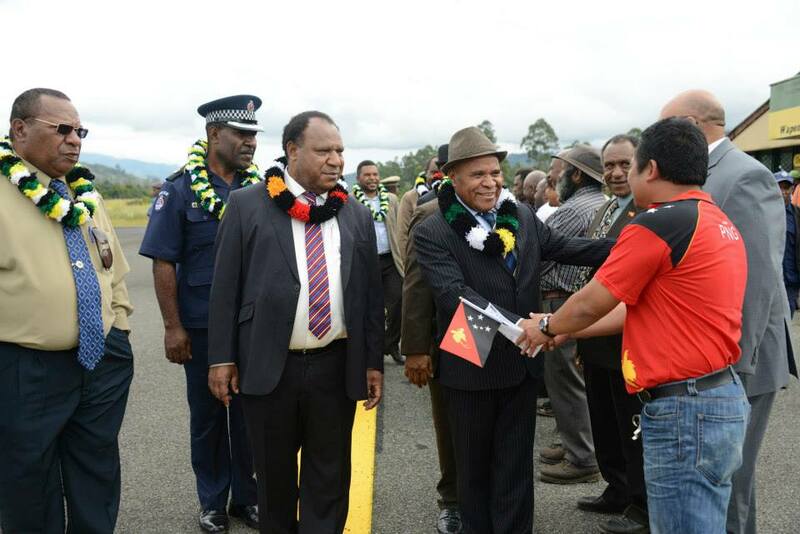 Minister Awesa was representing Prime Minister Peter O'Neill who was unable to attend, was accompanied by Governor for Western Highlands, Paias Wingti, and local member and Foreign Affairs Minister, Rimbink Pato. Other invited guests were present as well during the ceremony. He told the large crowd that the highlands region needed proper road networks to cater for further development aspirations. 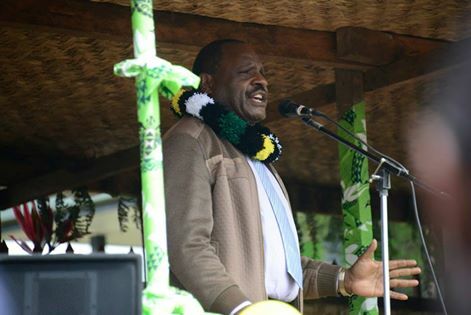 The government has committed K43 million towards these projects in Wapenamanda. During the ceremony Mr Awesa, also committed K25 million for the Wapenamanda-Task Road Construction and K10 million for the Wapenamanda-Lower Lai Road. 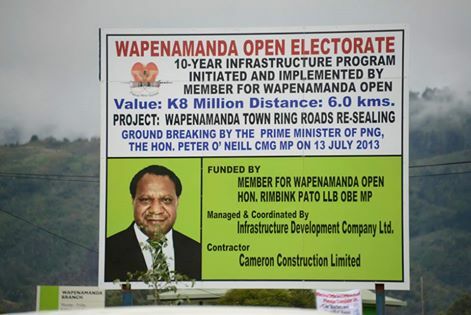 This funding of K43 million is a strong commitment by the O'Neill/Dion government to the people of Wapenamanda. 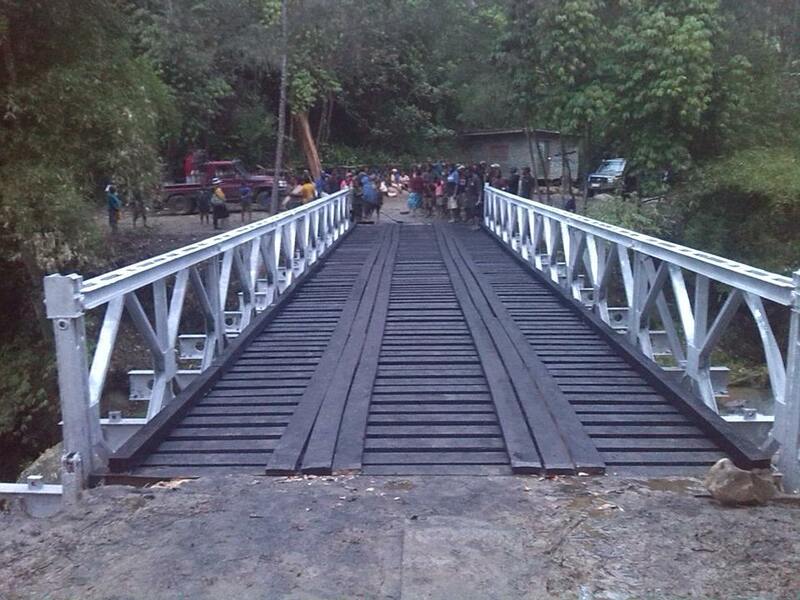 The Tai bridge in Tsak Valley has been restored by two (2) local contractors utilizing DSIP funding through the District. 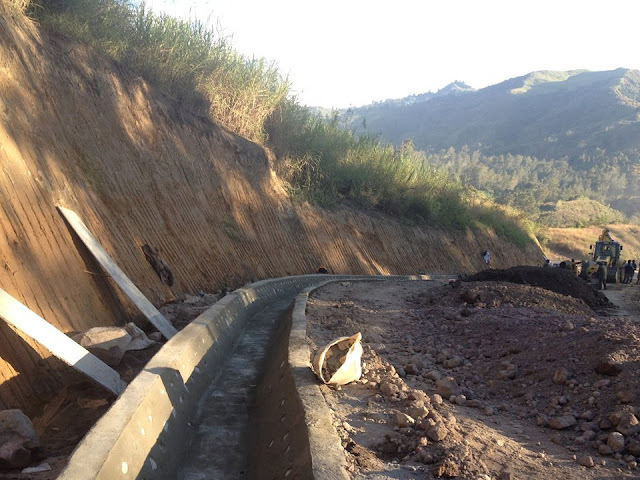 Now the Tsak Valley has an alternate route to Wabag via the Tsak to Akom road.